Heavy rain and high winds have closed roads and beaches on the Gold and Sunshine coasts, as a low pressure system heads south to the New South Wales border. The Bureau of Meteorology says the intense low pressure system has this morning moved closer to the Sunshine Coast. Wind gusts and patchy rain are expected to continue this afternoon. Beaches are closed on the Gold Coast, with pedestrian access to Main Beach and the Southport Spit also closed this morning because of safety concerns. 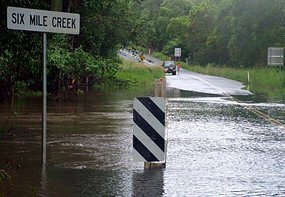 Five roads in the Gold Coast hinterland have been closed due to flooding. Queensland Racing spokesman Malcolm Tuttle says horse races could be cancelled across the south-east this weekend because of wet tracks. "The Gold Coast Turf Club has received in excess of 145 millimetres of rain since Monday," he said.